Last night Phoenix Coyotes goalie Mike Smith scored his first NHL goal. It was a beauty of an empty-netter. Just as the buzzer was sounding to end the game, the puck crossed the line. I love it when goalies have the opportunity to add a goal to their career highlight list because it happens so rarely. What a fun way to close out the win over Detroit. So far, this is my favorite commercial of the season. It’s all about the love of the game. I don’t care what team or player or league we’re talking about. I just love the game. One of my favorite things about the sports world is how it brings communities together. No city is a better example of that than Pittsburgh. 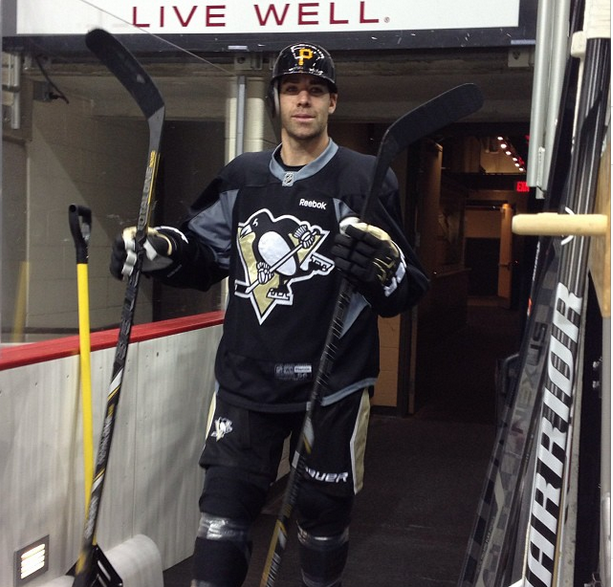 I love watching how the Penguins are supporting the Pirates in their playoff run this season. 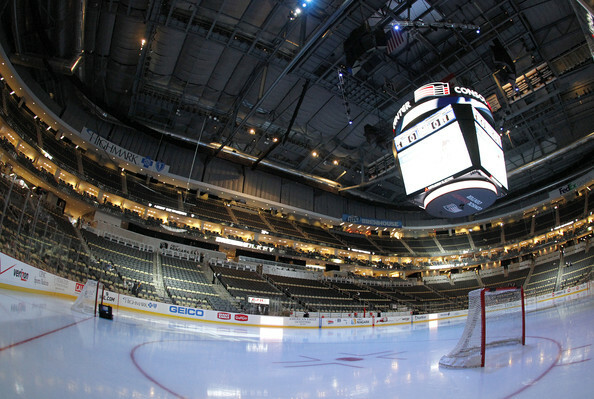 From playing baseball on ice after practice to raising the Jolly Roger in Consol Energy Center after this weekend’s win, the city pride is palpable. I don’t know much about baseball, and I’m not going to pretend to be a big Pirates fan, but you can’t help falling in love with the way the city of Pittsburgh is cheering as one right now. But let’s hope they don’t get crazy with their celebrations. 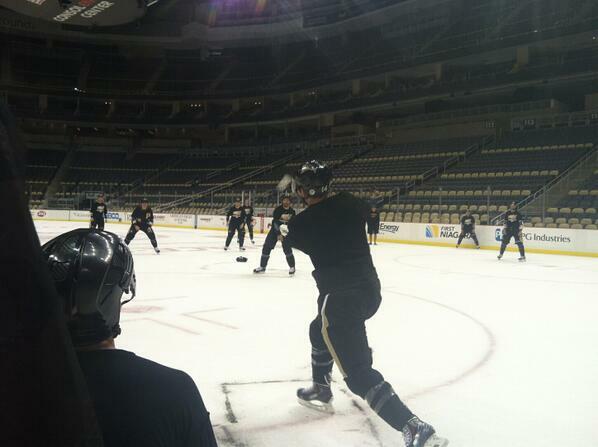 I’m convinced James Neal got his upper-body injury during that baseball game after practice last week. And that’s the last thing we need. It’s been nice to see other players stepping up in his absence, and it’s fun to see the abilities of younger players shining through — but I would like to have the Real Deal back in uniform soon. Next game is Tuesday against the Hurricanes. I’m looking forward to it because my sister lives in Raleigh and fancies herself a ‘Canes fan now. It’s funny how distorted peoples’ minds get when they move down south. I won’t hold it against her though. At least she’s paying a little more attention to the greatest game in the world. We’ll also get to see the Staals in action, which is always entertaining. Is the Staal Brothers drinking game still fun these days? The answer is always yes. 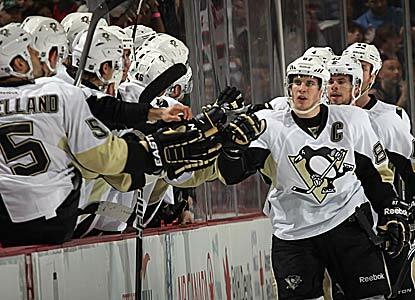 This time tomorrow I will be enjoying the end of the first Penguins regular season game! It feels like ages since they last laced up their skates. And now that several other teams have already started playing, I’m just getting jealous. I’m ready for my team to be back on the ice, too. As a Pittsburgh hockey fan living in Cleveland for the time being, I have my fair share of hockey viewing issues. 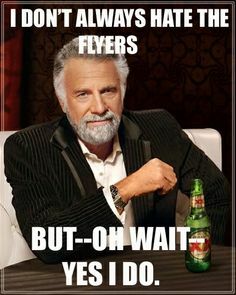 Luckily, a fellow Penguins fan at work lives just down the road from a bar that gets all the regional networks. We’ll be enjoying dinner and potentially some Yuengling with a group of friends tomorrow night. I hope this Cleveland bar is ready for some Pittsburgh pride. It’s going to be an interesting start to the season with today’s announcement that Vokoun is out for 3-6 months and Neal is day-to-day with an upper-body injury. Not to mention that Letang is on IR. I know we have a long season ahead of us, but I’m hoping we can start off with a bang. And I have high hopes that Fleury will come out with something to prove. Despite the talk surrounding his recent performance, he is and always will be my goalie. Have you watched a game yet? Who are you pulling for?